My first ever batch of Rosella jam. 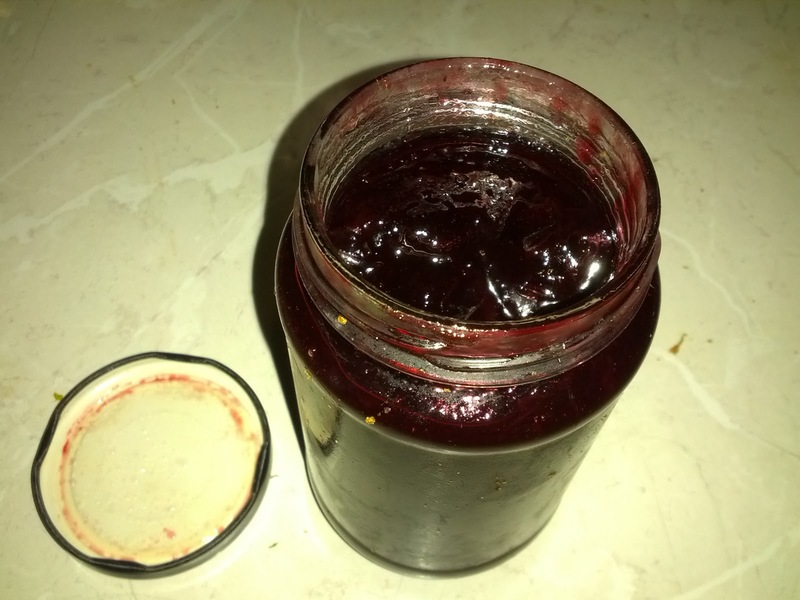 Well I think batch would be an exaggeration, as I had enough for exactly 1 jar... Well that enough for us, well at least to start with. 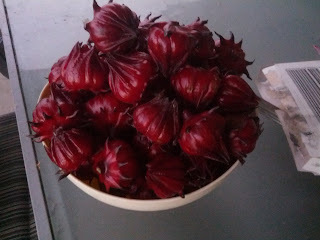 I picked the fruit from our flourishing rosella bush. Most people are surprised to find out I bought this last year from BigW. Having never tried rosella before, I only bought the one... now I wish I had bought a few. But this was its first flower, and following fruit. Now I had read that you should pick the fruit about 3 weeks after it has flowered. To be honest, this was difficult to judge, as the bud and the fruit look very similar. But I was forced to pick them on the weekend, as the chickens had already decided that the lower fruits were ripe. I quickly found out the best way to pick them, was to actually use a knife; as picking by hand seemed to damage the stems. Now rosella are part of the hibiscus family, and are native to tropical environments. The fruit is the petal like area (or calyx) surrounding the green pod or seed. I began washing the fruit in cold water and then peeling away the fruit. I have since read that using a knife along the base and then forcing the seed out is also affective. Now I believe the seeds are edible, though they are supposed to be very bitter and not pleasant. Therefore I planted a few (in the hope of propagating some more shrubs) and discarded the rest (some to the pigs, others in the bin). 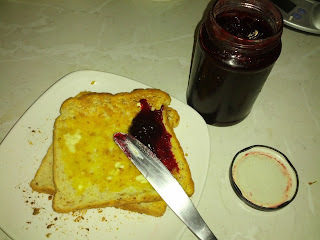 I later read that most people boil the seeds in water first, then strain the water to use to make their jam; as it extracts the pectin (natural setting agent in fruit) from the seeds. Oops! I did however find one recipe https://sites.google.com/site/mumscookbooksite/ believed there was enough pectin in the fruit and that the seed water was responsible for the bitter taste. 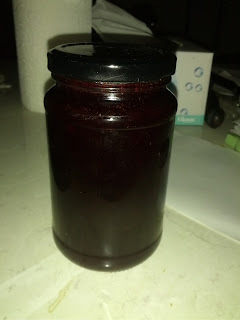 So I took her advise and made our first jar. So I want to take this opportunity to thank this blogger/website- as I thought I may have wasted all of our first haul. The recipe said equal weight of fruit to sugar and ½ a cup of water for every kilo of fruit. I had 234 grams, so added 150ml of water and brought to boil in a stainless steel pan. Then reduced to a simmer and gradually stirred in the 234 grams of (brown) sugar- as that's all I had. The liquid was already quite thick and gloopy looking. So simmer gently for a few more minutes, whilst I boiled the kettle to 'heat' my jar. So once I managed to set the lid back off, I poured the hot liquid straight in and sealed immediately. Once cooled we had to try it! I had been told that most recipes combine rosella with other fruits (apples) or spices such as ginger, or that the fruit was quite 'tart' like raspberry or rhubarb. So we were quite apprehensive and not sure what to expect... 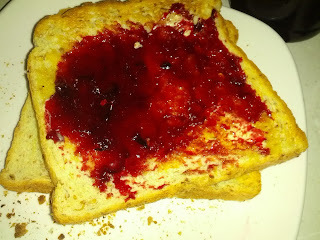 It was gorgeous, very much like blackberry jam my Nan used to make! So we're hoping to get a few more plants going, as I hoping this will become a regular staple in our household. Apparently the fuit is also uses as a syrup and beverage, even a tea. And the leave are edible, used as a spicy spinach served with fish, steamed in a version of dahl or dried with prawns in a burmese soup... so many options!